THERE was something fitting about the setting last Tuesday afternoon, as President of Ireland Mary McAleese laid a wreath, on behalf of the people of the country, at the main remembrance wall in the new Mayo Peace Park. On a blustery afternoon, which showers had tried to spoil, autumn leaves danced in the air overhead as the soulful cry of a lone bugler from the Irish Guards, sounding the last post, filled the air with haunting sentiment. Then, as the President rose to her feet, the sun – as if on cue from the heavens – shone brilliantly from between dark clouds to wrap the entire Garden of Remembrance in a warm glow. The ceremony was over. Twenty years of work was finished, and Michael Feeney’s dream was complete. On what was one of the grandest occasions seen in the county town for some years, ambassadors, dignitaries and military personnel from around the world had gathered amongst local people of all ranks and stature to witness the opening of the Mayo Peace Park and Garden of Remembrance, which commemorates the brothers and sisters of this county, who never returned from many of the conflicts of the last century. Among them was Michael Feeney’s grandfather, who fell on July 22, 1915, in Levante in northern France. Seventy years later the grandson he never knew would begin a crusade, which now sees his name, and those of others from Mayo who died alongside him, inscribed on the walls of the Mayo Peace Park on Lannagh Road in Castlebar. Captain Donal Buckley welcomed the large crowd to the event around 1.30pm, outlining that in the year that marks the golden anniversary of Ireland’s first military contribution to the United Nations, and the ninetieth anniversary of the ending of the Great War, it was wonderful to be present at the opening of a memorial that is ‘all-encompassing, apolitical, represents genuine military traditions on the island of Ireland, and commemorates officers, those from listed ranks, and civilians from County Mayo, who selflessly gave their lives in the service of their country in whatever uniform’. Addressing the issue of a reluctance in Ireland to acknowledge those who died fighting in British uniforms for many years, he spoke of tempestuous times that followed the end of our war with Britain in 1922, caused in Ireland, he felt, by bitterness and a lack of acceptance at the democratic process, and in the UK by a denial that a small country, which for so long had been under British control, had in fact got its own way. “The memory of the heroism and sacrifice of the Irish divisions in the Great War became a casualty of this bitterness and denial, but our Great War dead will now no longer be forgotten,” he said. “No matter how complex the reasons, no matter how deep the political convictions, there is now no excuse for forgetting those who died for us and our freedom. The soldiers, sailors and airmen who fought in the horrors of the first industrialised war, the war to end all wars, should not have had their memory sacrificed on the altar of politics. “Thankfully, this shame is now reversed,” he said, before the names of the fallen not yet etched on the polished memorials of the Peace Park were read out to the lament of a piper. A parade of ex-service personnel, from UN veterans to the Irish Navy and all between, had earlier marched from Davitt College and, in full uniform and colours, had taken up positions all around the park. They listened intently to a short religious service at which Archbishop Michael Neary and Bishop Richard Henderson spoke of the common Christian concern that had brought everyone together to honour those who died in the quest for world peace. “We give thanks for those whose names are recalled here and call for them to be rewarded for the dedicated way in which they gave their lives,” said Archbishop Neary, before blessing the wall. This was followed by words from Mayor of Castlebar, Cllr Kevin Guthrie, and Cathaoirleach of Mayo County Council, Cllr Joe Mellett, both of whom spoke of the significance of the occasion and their delight that the memory of the fallen was being preserved in Mayo. Then, at 3pm, the President arrived, and with all present standing to attention in silence, she inspected the Captain’s Guard of Honour provided by three officers and 104 soldiers from the 1st Battalion of the 4th Western Brigade from Galway – commanded by Captain Edward McDonagh from Bangor Erris – as the band of the 4th Western Brigade played Amhrán na bhFiann and the Presidential Salute. As Commander-in-Chief of the Irish defence forces, the President was then welcomed to the ceremony, and addressed those gathered, thanking Michael Feeney for his invitation to her. She described the Peace Park project as a simple gesture of respect in honour and memory of all those from Mayo who gave their lives in the unselfish service of others. “Some gave service in the uniform of the Irish Army on service with the United Nations, while others wore the uniforms of other armies, the British Army, American, Canadian, Australian, New Zealand and indeed many others if we cast our minds back over the centuries of our complex history, she said. “Some of those who died were destined to be well-remembered. Others, particularly the 50,000 or more who died in the Great War, were destined to have their memories consigned to shoe-boxes in attics until recent years, when a great longing for reconciliation allowed us to remember differently. President McAleese said that though Ireland is a small island with an embedded tradition of military neutrality, we have never shirked in our responsibilities to the cause of world peace. She added that Mayo’s sons and daughters have made and continue to make their distinctive contribution in this regard. “We hold them all in our hearts, these young people that never came home, and this is probably the first generation to be able to reconcile and revere all those memories, to hold them all in the one heart,” she said, before concluding on a quote from Mayo poet Anthony Raftery, whose memory she said was kept alive by Ireland’s first President, Dr Douglas Hyde. Her final act before meeting the veterans was to lead the dignitaries present on a wreath-laying ceremony, with a large wreath that was presented to her by Anna Feeney, Michael’s daughter, as the centre-piece of the display. MICHAEL Feeney’s face beamed with pride as he led President Mary McAleese through the crowd into the Mayo Peace Park last week. It was the culmination of two decades of hard work, and the highlight of a lifetime of study and research dedicated to the cause of the forgotten war dead. He had many people to thank, and started with the members of the Peace Park Committee, of which he is Chairman. 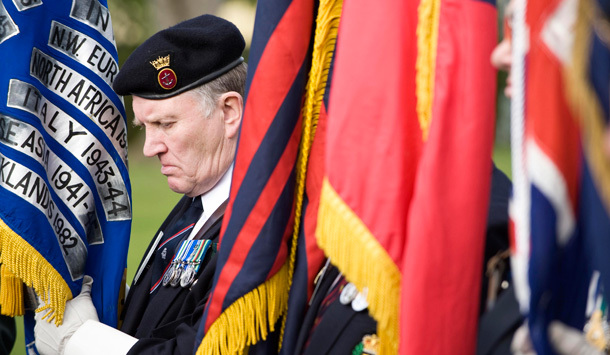 Michael (pictured) also offered a special welcome to the families of the fallen – especially those who travelled long distances, from Hong Kong, Australia, the USA, Britain, Canada and other parts of the globe. “Today, the families have respect and dignity given back to them as their years of silent grief can be committed to the past,” he said, also thanking President Mary McAleese for performing the official opening. Michael went on to explain how in the early days of the project, Mr Gerry Casey from Castlebar willingly donated a large section of the park, with Mayo County Council then taking the project to their heart and offering the front portion to complete the holding. Admitting that there were too many people to thank individually, Michael did manage a mention for Mike Walsh – an architect and former British officer – who, he said, gave invaluable assistance, as did Peter Gill, Ernie Sweeney, John Basquill, Lieutenant Colonel Noel Byrne and Captain Donal Buckley.